A two-dimensional barcode is a matrix composed of black modules arranged inside a white square pattern. There are different types of 2D barcodes and they can be decoded either using a smartphone or using specific readers. Before going into the more detail on modern 2D codes, it is worth mentioning that their predecessors were the alphanumeric serial codes, used for decades due to being very simple and easily read. The first barcodes were introduced in the 40s and are still used on many retail products. The fact that they can be read automatically reduces checkout times and the risk of errors. Barcodes have been a real revolution for small and large producers throughout the last century. Despite this, the problem related to the amount of information to be encoded has arisen since the 80s due to the fact that barcodes are only able to contain a limited amount of data. To overcome this problem, two-dimensional codes were introduced to the market and this often removes the need for separate external databases. The DataMatrix code is a two-dimensional code that usually consists of black and white modules in rectangular or square pattern. This code can contain a large amount of information despite its very small size: it is able to tell us what material the object is made of, who made it, where it was made, when, from which company and its precise dimensions. By reading this code on a product, we can find out all the details, avoid counterfeiting and optimise the production process with precise and effective control. The other great advantage of the DataMatrix code is its versatility, given that it can be applied to any product including: aerospace vehicles, medical instruments, electronic components and items in the automotive sector. If we take a look at the DataMatrix, we can see that the two adjacent sides of the code are composed of solid black lines, while the other two are composed of alternating black and white pixels. The black lines on the left and bottom of the DataMatrix help software localization of the code. The other two ends identify the number of columns and lines of the code and help identify the spatial frequency of the points used in the DataMatrix: the location information is the one that takes up the most space physically and is placed along the sides. What are the differences between barcodes and DataMatrix codes? The barcode we’re used to is made up of light and dark lines that represent letters, numbers, or a combination of the two. It is generally accompanied by a numerical code (EAN) and can be found on any product on the market. Despite being effective for articles and consumer goods, this code is not enough to track and identify a more complex product. This is why the DataMatrix code was created, nearly thirty years after the barcode was introduced. It has been deemed the nephew or third generation of the barcode. The major difference between the two is that the latter is an analogical code, meaning that the information it holds must be a certain size and in perfect condition in order to be read, both in terms of contrast and in the positioning of the elements. 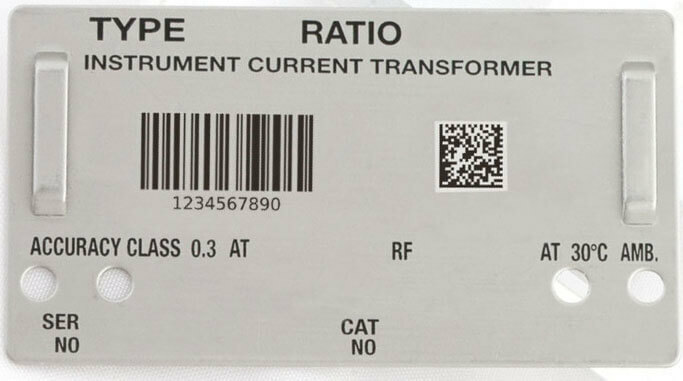 Unlike the bar code, the DataMatrix code is digital, much easier to read and more difficult to damage due to how small it is (usually between 5 and 10mm). What are the differences between QRcodes and DataMatrix codes? The QRcode (abbreviated from Quick Response Code) was developed to allow rapid decoding of its content. As you can see in the image, the QRcode is different from the DataMatrix and the largest graphic space is occupied by geolocation information. A QRcode is able to hold up to 4,296 alphanumeric characters, has a 30% error correction capability and is mainly used for online and commercial applications. The best thing about this code is its ability to handle special characters (such as the Japanese alphabet) and the ability to interface easily with networked resources. The DataMatrix code on the other hand can hold up to 2,335 alphanumeric characters, 33% error correction capability and can enclose a large volume of information in a very small space. That’s why it is the ideal solution for database tracking and supply systems for professional use. 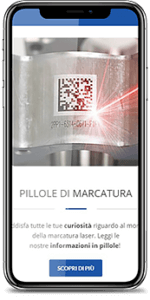 The high readability also makes DataMatrix codes more suitable for industrial applications in various sectors and satisfies even the most demanding producers. Another interesting fact about the QRcode is that it is often applied to the packaging of the product, so once the package is discarded, the information is lost. DM codes are applied directly to the product, to hidden areas, so that any useful information is preserved but the design and aesthetics are not compromised. Something curious that both of these codes have in common is that they both require a white border, which is called a quiet zone. This guarantees correct reading and interpretation of the data present. How is a DataMatrix code applied to a product? Once we understand the huge benefits of the DataMatrix code, we then need to understand how it can be applied to our products. 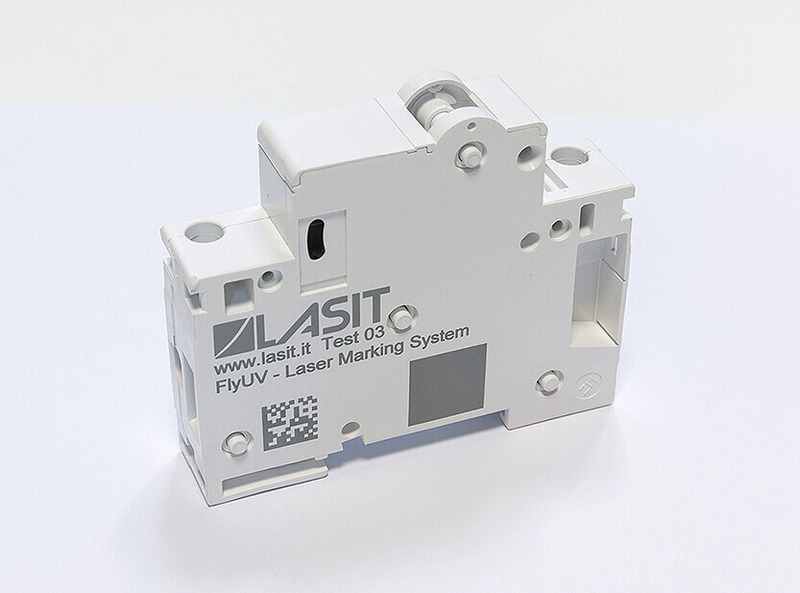 The best way to do this is undoubtedly laser marking, both because it can be applied to many materials (plastic, metals, and wood), but also because it allows you to create codes using the extreme versatility of ASCII characters and symbols, which can be changed directly from the within the software. The laser marker even allows you to enter the code at a certain depth, so that it is more durable and to keep track of our product. A large industrial production process needs to be integrated to save both time and cost. 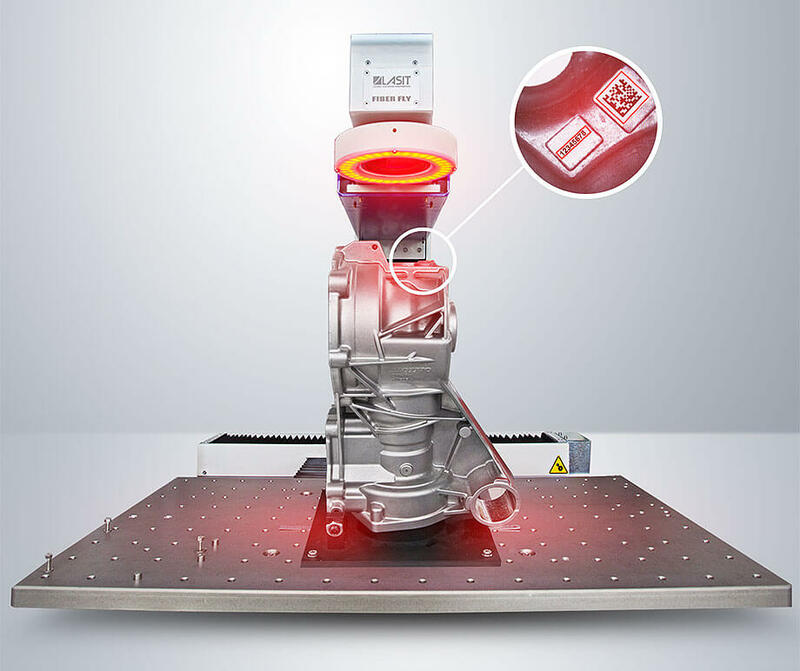 Laser marking systems are designed to be highly dynamic, integrated and configured according to the production chain, and connected to the software. 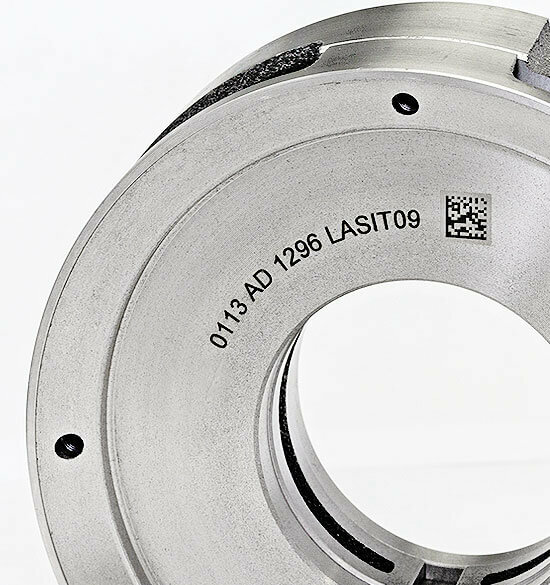 Laser marking is indelible and almost impossible to damage. This is essential where we need to get information about a damaged product or after a long period of time. An automated process allows us to monitor data constantly so that we can access any information required for production or to make necessary changes before the next phase. The laser spot is very small, which means it can also mark difficult to reach parts of the product without compromising aesthetics and design. 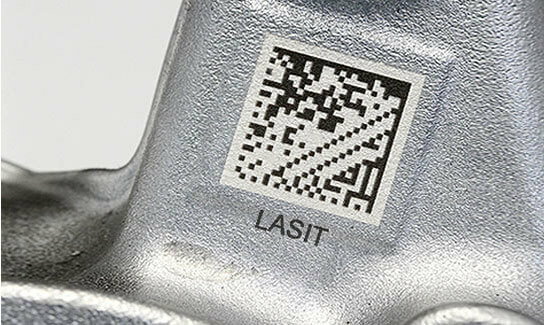 Laser marking is more cost-effective than other traceability systems, given that there are no costs for maintenance or disposal of waste materials. Laser marking guarantees very high precision even with complex geometric details and the material is cleaned at the end of the process to guarantee perfect results.